Information architecture combines IT skills with business skills in order to align the IT structure of an organization with the mission, goals, and objectives of its business. This friendly introduction to IT architecture walks you through the myriad issues and complex decisions that many organizations face when setting up IT systems to work in sync with business procedures. Veteran IT professional and author Kirk Hausman explains the business value behind IT architecture and provides you with an action plan for implementing IT architecture procedures in an organization. You'll explore the many challenges that organizations face as they attempt to use technology to enhance their business's productivity so that you can gain a solid understanding of the elements that are required to plan and create an architecture that meets specific business goals. 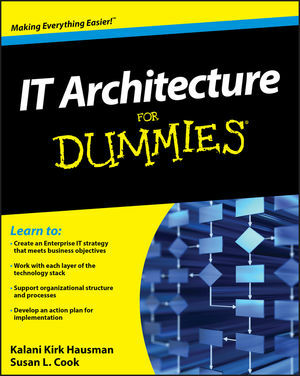 While companies look to technology more than ever to enhance productivity, you should look to IT Architecture For Dummies for guidance in this field. Kalani Kirk Hausman is a specialist in enterprise architecture, security, information assurance, business continuity, and regulatory compliance. Susan L. Cook is a Senior IT Policy and Security Programs Administrator and a former compliance auditor. Both are employed by Texas A&M University. Part I: Developing the Architecture. Chapter 1: Planning for Enterprise Realignment. Chapter 2: Exploring Tasks, Roles, and Tools. Chapter 3: Pondering Platform Pros and Cons. Part II: Defining the Role of IT Architecture. Chapter 4: Reducing Complexity through Standardization and Consolidation. Chapter 5: Planning Enterprise Information Security. Part III: Creating an Enterprise Culture. Chapter 7: Developing Identity and Access Management Strategies. Chapter 8: Developing a Network Culture through Collaboration Solutions. Chapter 9: Reviewing Communication Methods. Part IV: Developing an Extended Network Enterprise. Chapter 10: Managing Data Storage. Chapter 11: Managing Application Development. Chapter 12: Planning for the Mobile Enterprise. Part V: Obtaining Value beyond the Basic Enterprise. Chapter 13: Virtualizing Enterprise Systems. Chapter 14: Facilitating High-Performance Computing. Chapter 15: Enabling Green IT. Part VI: Protecting the Enterprise. Chapter 16: Planning Technology Updates. Chapter 17: Planning Security Strategies. Chapter 18: Planning Business Continuity and Disaster Recovery. Chapter 19: Ten Challenges for Redesigning an Existing Enterprise. Chapter 20: Ten “Low-Hanging Fruit” Opportunities.